The pawns in this set are Villagers on the Hunter side of the board and Zombies on the Monster side. Eight Zombies and eight Villagers are included in each set and are approximately 2 5/8 inches high. All the pieces in this set mirror each other; the two Queens are captured in the same pose, etc. The pawns are the exception to this rule. 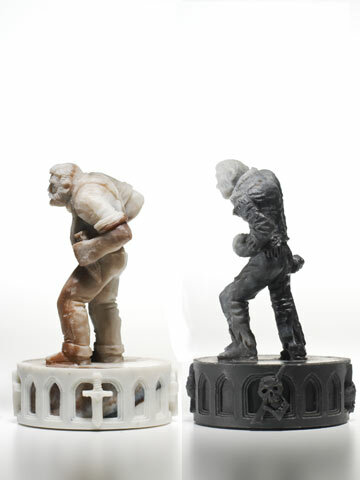 The Zombie Pawn is trying to hold himself up like the 'Villager', but being (un)dead, he just can't quite pull it off. Please click on 'ROTATE' to view the pawns from all four sides.